BRAC Bank Limited is one of most leading private commercial bank in the country having wide branch and associate network throughout the country. This bank is originally SME focused bank. And it has been playing a vital role in socio economic, industrial and agriculture development as well as in the overall economic development. SME Banking division SME is an additional and specialized horizon of the bank which serves the bank’s special focus in promoting broad based participation by catering to the small and medium entrepreneur. The network of SME has already been established throughout Bangladesh. BRAC Bank Limited is a full service scheduled commercial bank. It has both local and International Institutional shareholder. The bank is primarily driven with a view of creating opportunities and pursuing market niches not traditionally meet by conventional banks. BRAC Bank has been motivated to provide “best-in-the-class” services to its diverse assortment of customers spread across the country under an on-line banking dais. At present, BRAC Bank is one of the fastest growing banks in the country. In order to support the planned growth of its distribution, network and its various business segments, BRAC Bank is currently looking for impressive goal oriented, enthusiastic, individuals for various business operations. The bank wants to build a profitable and socially responsible financial institution. It carefully listen to the market and business potentials, It is also assisting BRAC and stakeholders to build a progressive, healthy, democratic and poverty free Bangladesh. It helps make communities and economy of the country stronger and to help people achieve their financial goals. The bank maintains a high level of standards in everything for our customers, our shareholders, our acquaintances and our communities upon, which the future affluence of our company rests. According to the Half-Yearly Financial Statement of 2013- the number of Employees including contractual engaged for the whole year or part there of (who received a total yearly remuneration of Tk. 36,000 or above) were 6,306 where as the total number of employees were 7,075 as the same period of pervious year. Human Resources are essential and foundational to the growth and development of any organization and hence the ability to satisfy and retain quality and trained employee is vital. It must be therefore very crucial to identify if there is an underlying dissatisfaction amongst the existing employees of the organization. Therefore, the bank is the largest beneficiary because through this report we can identify how to confront the challenges. This report will give a clear idea about „Human Resources Department in the BRAC Bank Ltd.” How efficiently they utilize their resources? What types to benefits they offer to their employees to motivate their work? Does the recruitment process is effective? What additions system BBL can apply further towards employee for work hard? To have answers of all these questions, it is tried to go through the BBL HR policies; with three months working experience in HR and had discussions with officials of different wings. In order to attain the objectives, collection of primary data is necessary. This data will be used to analyze the problem statement. The largest part of the analysis however would obviously be conducted by carrying out the employee satisfaction survey. The intention is to obtain a randomly selected unbiased sample of 30 employees across the bank and to question them on various HR Grounds to assess the employee satisfaction level. Therefore the methodology would include relevant information is collected from interviews, Surveys, observation and annual reports of the bank. The relevant information is collected from the primary sources and also uses the secondary sources of information. In full time category, employees are joined as probationary for six months or one year depending on job category. They also have to sign a deed for 5 years a long with depositing taka 2 lac refundable. The regular employees are allowed to get the bonus, incentives and other allowances with their basic salaries. And these types of employees also have the benefit of getting extra facilities the BRAC Bank limited is providing for their employees. Contractual employees are taken for specific period like six months basis. Along with their salary, they get attractive performance bonus if they achieve their target which determined by organization. HR temporary contract are for those categories whose Job description is such, where he/she needs to be under the direct supervision of Bank‟s authority, whose performance is monitored by the Bank Management. They might be specialist, consultant, and specially assigned staff. Staff under HR contract are those people who directly or indirectly deals with customer, has access to Bank‟s confidential data‟s & valuable properties (car, etc. ), deals with sensitive areas, also where staff need to deal with customer as a representative of BRAC Bank directly. Other contractual employees are not entitled for any service agreement. They will be recruited through outsource agencies. The requirement of any support staff through outsource agency must come through HR signed by the Division Head. HR will send the requirement to provide staff by the Outsource Agency. Outsource Staff recruitment depends on the budgeted requisition of the staff from the respective departments. However, for non-budgeted requisition it will go through after the approval process of MANCOM. The bank reserves the right to terminate the contract with the Outsource Agency without assigning the reason whatsoever. The Outsource Staffs salaries are fixed and they won‟t get any allowances with their salary. To encourage and help human resource development in the financial industry the Bank may decide to offer internship programs to individuals or educational institutions. The decision to enter such an engagement will be decided by the MD& CEO on the recommendation of the Department Head. The HRD will prepare the proposal of such engagement with individual/institution and forward it to the MD& CEO for consideration with the recommendation of the Head of HR. Individuals engaged as Internees will be paid a consolidated Honorarium of Tk. 5000/- per month, as decided by the MD/MANCOM and will not be entitled to any other benefits. Managing Director & CEO will determine and analyze the necessity of intern on the basis of yearly budget and also requirement of special projects. As per requirements Department Head will make the intern requisition and after receiving intern requisition HR will take 15 days for an intern to join. All Internships program will be for a three months. Prior approval by MD& CEO internship program can be extended for a maximum period of six months. Management Trainee Officers highly qualified students of BRAC Bank Limited. The MTO‟s are regular employee but they have to learn as a student inside BRAC Bank for the period of one year. After one year if they can complete their learning period successfully they will become a senior officer directly from the MTO. Having a Human Resources Department in Bangladeshi business organizations today is becoming a common and important part. But Human Resource Management is a relatively new discipline to study and implement in this part of Asia and in most organizations HR Department work as a „Support‟ department to the organization. Whereas it was supposed to be an integral part of the business without which an organization cannot maximize the utility of its most valuable resource, which is the workforce, the employees of the organization. In HRD, there are 24 permanent employees are currently functioning. In BRAC Bank Ltd. there are three different divisions of departments. One is „Business‟, another is „Support‟ and the other is „Operations‟. Here also HRD is a Support department to the Bank. The „Business‟ division includes the departments which are directly related to the Banks banking business, banking products e.g. SME, Retail, Corporate etc. Whereas „Operations‟ division includes departments related to logistics, transports etc. e.g. the GIS (General Infrastructure Services) Department. BRAC Bank also outsource for contractual posts e.g. the Bank is currently outsourcing from an organization named “CLEANCO” for floor maintenance. They also hire HR Contracts who, upon satisfactory performance and experience, can achieve a regular post in the bank. The HR policies regarding employees of BRAC Bank will be discussed later. Bank HRD‟s functions does not differ much. According the HR discipline, they too have a recruitment division, compensation & benefits planning division and there are performance measurement methods and rewards for good performance as a motivational drive in BRAC Bank HRD‟s policy. The HR Administration division and MIS & Strategic planning division is now under HR Operation Wing. The functions of BRAC Bank HRD are discussed elaborately in the following sections. The recruitment division is responsible for collection of CVs, Job Applications for vacant posts, Internship Applications etc. The recruitment officers collect and store these hard copies and also updates, maintains computer databases regularly. The recruitment officers‟ task is to organize CVs for potential candidates so that in time of recruitment they can be found and short listed within a reasonable time. The very general idea about the functions of recruitment division is that after CV short listing, the short listed candidates are contacted (usually by telephone) for interviews. In case of large number of candidates, letters are mailed to the applicants/candidates mailing address. These are done according to the interview schedule made before contacting the candidates. The interview or written test schedule is made prior to contacting with the short listed candidates by communicating with respective departments who submitted requisition for the needed workforce. The respective Department Heads accompany the Head of HR in the interview board and cross Department Heads also join the board. After the interview the recruitment division acquires the Interview Score Sheet which is printed and handed to Interview Board before starting the interviews. The filled out Interview Score Sheets are then used to list the finally selected candidates for the respective posts. According to the Score Sheets, the Recruitment Division issues Offer Letters/Appointment Letters to the finally selected candidates and requests them to collect their Letters from the HRD. The new employees are then greeted to finish all the official formalities (e.g. Bond Signing, PIN number assignment etc.) and assigned a joining date in their respective departments. Written tests are only arranged when necessary, usually in case of large number of applicants. Before a recruitment process is completely finished, the recruitment officers must communicate with the Learning and Development Officer so that they can arrange orientation or initial training sessions for the newly recruited employees on time. This is done frequently because most of the time the posts getting filled up require an initial training or orientation. BRAC Bank also provides a large number of internship opportunities for students all over the country. Communicating with different departments and finding out open internship scopes is one of the tasks for a recruitment officer. Departments, Branches also communicate with Recruitment Team whenever there is an Internship opportunity is available in their respective stations. Matching the subject studied by the student and the open department enables the recruitment officer to make decision in selecting an intern. BRAC Bank HRD gives priority to interns (who have successfully completed their internship in any department or branch of BRAC Bank) when they apply for a vacant post. (1) A properly filled-out Staff-Requisition Form is submitted by the concerned Department Head or Manager. (2) The Requisition should be supported by the Manpower Budget for the year; otherwise, a Non-Budgeted Requisition must be signed and approved by the Managing Director upon stating valid reason for the recruitment. (3) Determining the type of recruitment is the next step so that source of CVs can be identified. For a Full-Time/Regular post an Internal Job Watch must be circulated with details of the post throughout the bank using Lotus Mail. External CVs are also accepted for a post offered through mail but in these cases, internal source is preferred by the concerned department as some posts require existing, experienced employees within the bank. For example, a Regular post open in Unsecured Value Center usually prefers an HR Contract working in Unsecured Value Center for past two years with satisfactory performance. a) the employee must have worked 1 Year after his/her confirmation and completed 1 continuous year of service in his/her current department. c) Must have completed 8 mandatory E-Learning courses. (5) Condition for HR Contracts is 2 years of continuous service in the current department. (6) For external CVs the Recruitment wing looks into the archive of CVs applying for any suitable post and for large recruitments we publish circular in Newspapers. Usually in “”Prothom Alo” and “The Daily Star”. (7) On the day an Internal Job Watch closes or a Paper Ad reaches deadline for CV submission, the Recruitment wing checks all the CVs as an initial screening and then sends the CVs for final short listing to the concerned departments who submitted requisition. The finally selected applications are then called (issued interview cards in case of large recruitments e.g. CRO’s for SME Banking) for an interview after setting an interview date and venue. The recruitment wing manages Internal Job Postings, recruiting HR Temporary Staffs and Outsourcing Staffs. The Service Level Agreement (SLA) schedule is strictly followed by all concerned wings. Board of directors holds the authority to finally decide any matter regarding any sort of recruitment. Besides they are the supreme authority to create any kind of new position. BRAC Bank must recognize the importance of manpower estimation and accordingly an organization structure should be prepared for the Bank and for each Division & Branch. The organization structure shall however, not be rigid, it may be reviewed and revised when necessary from time to time. Subject to review from time to time, the competent authority as per power delegated by the Board will make the appointments. All regular employees will appointed by the Managing Director. All HR contract and outsource contract employees will be appointed by The Head of Human Resource Division. The schedule of recruitment will be created according to the Service Level Agreement (SLA). The interview board will with The Head of Department of that post, The Supporting Department Head and The Head of HRD. Officer Grade I and Officer II can appoint directly after the interview. From Senior Officer and more there will be a second interview with the Managing Director of BRAC Bank Limited after the first interview. For internal job posting the employee can only apply if he has the service time in BRAC Bank is more than two years and also need to recommend the candidate‟s application by the reporting supervisor of the employee. The HR Contract employee can apply for the regular post after servicing more than two years in the BRAC Bank. Outsource Staff can apply for the regular post after servicing more than three years in the BRAC Bank. The new recruited will get the probationary period of one year if the employee has less than three years of working experience and will get the probationary period of six months if he has more than three years working experience. The Bank is committed to follow a fair, competitive and flexible remuneration policy. The Board is the final authority for approval of this policy and will amend and review the policy on recommendation of the Managing Director / Management Committee periodically. The remuneration policy of the bank will cover all persons engaged in permanent service of the bank. The Salary structure of the Bank is based on the aforementioned Job Grades. Job grades are decided on the basis of an analytic assessment of the position based on the size, responsibilities, decision-making authorities and the nature of the job. Salaries are confidential between the employees concerned and the Management. The salary ranges for these job grades are reviewed from time to time. HR Temporary & outsource staff do not have any assigned job grade. The contracts get a consolidated payment per month and there are no other entitlements applicable except commission based on job criteria. Basic Salary Ranges (BSRs) is commensurate with the job grades and is determined by the Board on the recommendation of the Managing Director. The Board reviews the BSR at least once every two/three years. House Rent Allowance may be paid to the employees at such rates and on such conditions as may be prescribed by the Competent Authority from time to time. Medical Allowances may be paid in accordance with the job grades and on such conditions that may be prescribed by the Competent Authority from time to time. All regular and confirmed employees get two bonuses each year. One in Eid-Ul-Fitr and another during Eid-Ul-Azha only for Muslims and employees of different religion gets that bonus during their respective religious festival. There is also a performance bonus system maintained by the Compensation, Pay & Benefits wing. But final evaluation is always decided by the MANCOM. Other than the above benefit there is a Provident Fund System, a Gratuity System, Group Hospitalization Insurance Policy, Employee Security and Welfare Fund maintained by the Bank. Regular and confirmed employees can apply for House Building Loan and Car Loan. Allowances are also available to only regular and confirmed employees but Car Allowances are only for the grades above Senior Princip1al Officer (SPO). There is an annual increment for all regular and confirmed employees on their joining anniversary. Festival Bonus will be paid to all confirmed officers/staff at one month basic salary which will be reimbursed twice in each calendar year. All confirmed employees would get one bonus during Eid-ul-Fitre and another one for Muslims during Eid-ul-Azha and for others based on their respective religious festival. Non-confirmed employees will be entitled to get Festival bonus as pro rata basis depending on his/her BBL joining Date. HR Contract & Outsource Staff would get 1 bonus, which is 50% of this gross salary. The Board of Directors at its discretion, based on the Bank‟s profit will declare a certain percentage of the pre-tax profit as Performance Bonus. The contribution measurement will be coming from the Performance Matters. Performance Matters for such purpose shall be made on the criteria set by the management from time to time. No bonus will be applicable to the employees rating marginal & unsatisfactory. Final Evaluation will be decided by the MANCOM for the entire bank after going through a „rating‟ process to ensure that a consensus is reached for the entire bank. Leave Fare Assistance is a non-recurring benefit for all the permanent employees of the Bank who have completed at least one year service. According to Bangladesh Bank policy all the permanent employees have to take 15 days mandatory leave in one go and LFA will give in this leave period, so that everyone will be encouraged to avail the leave. The Board has approved the LFA in its 92nd Meeting. BRAC Bank provides Leave Fare Assistance to its Employees to ensure that the employees enjoy a sound mandatory leave of 15 days in one go. This will definitely enhance the employees‟ satisfaction and it will enhance competitiveness with peer organization in the industry. Every Permanent employee of the bank is eligible to receive the LFA who have completed at least one year service. This benefit is available at the time of mandatory Leave. However, after completion of one year service and being confirmed, calendar year must have the option to accommodate staff mandatory leave. LFA will be given at the time when an employee will avail the 15 days mandatory leave.LFA will be the one month‟s basic salary of processing month for current and future treatment. For previous treatment, the amount will be one month‟s basic salary of Mandatory Leave Availing month. Every Confirmed Employee is entitled to receive LFA only once in a year. If any staff fails to go to mandatory leave his/her LFA will not be carried forward. That means in a calendar year only one LFA will be given to the staff. The Staff has to have enough leave balance to accommodate 15 days one go leave, otherwise s/he will not be entitled to have the Leave with LFA. Staff can‟t claim the mandatory leave after separation situation arise that means if an employee resigns from the services or in the notice period s/he can‟t claim for mandatory leave with LFA. The other hand if any staff is terminated/ dismissed s/he can‟t claim for mandatory leave with LFA after receiving the letter. Government rules and regulations will be followed regarding tax issue. LFA will be included in the income certificate of staff for tax return purpose. After receiving Mandatory Leave application HRD will produce the Pay Slip. Head of HR will approve this slip and send to FAD (Funding Allowance Document) for payment and FAD will pay accordingly. It will be come into force from January 2008 according to approval of the board. Employees of the bank below AVP are requested to take up a post-paid mobile at their own expense according to departmental need and also given a ceiling on the basis of their job functionality. All others except SME will have to get their monthly bill approved by the departmental/divisional head prior to submission for payment disbursement. Others may avail a bank‟s mobile, provided they seek prior approval from the competent authority. In the event where hospitalization or surgery is required for a member of the officer‟s (confirmed employee) dependent (Spouse and Children) including hospitalization on account of maternity – the Bank will reimburse the officer (Group C) up to a maximum of Tk.35,000/- per annum, for executives (Group B) Tk.100,000/- per annum and 200,000/- per annum for MANCOM (Group A). The Gratuity Fund is a terminal benefit that an employee receives at the time of retirement/resignation. Regular confirmed employees who have completed at least 5 Years continuous service are entitled to receive Gratuity Benefit. The custody, management, investment and control of the fund shall be vested in the board of trustees. Regular employees after confirmation need to fill up and submit the “Application for Enrollment as Member” to become a member. There shall be at least 6 trustees of the fund. Trustees will be nominated by the MD. The MD shall be an Ex-Officio Member and Chairman of the Board of Trustees. – The Head of Human Resources – Ex-Officio Member. – The Head of Financial Admin – Ex-Officio Member. – At least three representatives from the members as nominated by the Chairman. If there is a shortage of member of the board of trustees due to resignation then the Chairman can nominate trustee/s to reach the minimum number. The Board of Trustees shall meet at least 4 times in a calendar year. At least 7 days priornotice should be given to the trustees before a meeting. All money of the fund shall be deposited in a Special Account with any bank, This should be mentioned here that the Account is maintained jointly by authorized members of the board of trustees. The Trustees are authorized to invest the surplus money of the fund in accordance with the provisions of Company Act 1994 and Income Tax Rules 1984. The objective of the fund is to provide predetermined monetary benefit against Death and Permanent Disability of regular confirmed staff to his/her Dependent/Heir/Nominee by the Bank. All Regular Confirmed employees are eligible to avail this benefit. The fund for this benefit is created solely with The Bank‟s Contribution. The Bank will contribute Taka 5.00/Thousand on a yearly basis against the last basic salary of each eligible employee. (The rate of contribution may be changed subject to the approval of the board.) The Bank maintains a liability account to manage the fund. The total amount of benefit will be equal to 36 times of the last basic salary of the employee. – If an eligible employee dies within the term of employment. Disability resulting from accidental means that is continued for at least Six months and is certified by Bank‟s designated doctor as incurable. – For further injury of Employees with pre-existing degree of disablement. – Attempted suicide or self-inflicted injury. – Civil commotion, Assault, homicide or any war like operations. – Making an arrest as an officer of law. – Accident while the employee is affected by Alcohol/Drug. The Board of Directors reserves the power to close fund at any time. At such event the fund shall be refunded to the Bank. The BRAC Bank employees‟ provident fund requires the employer i.e. BRAC Bank Limited to contribute to the fund 10% of basic salary for all regular confirmed employees. Every member of this fund on retirement is provided with a sum of money as determined by the established rules for the fund on retirement or resignation from his or her services. This fun has been effective from the 1st of January 2003. A board of trustee is entrusted with the control, management and investment of the fund. The trustees of the board are nominated by the Chief Operating Officer (COO) who also holds the right to replace any such trustee. Each trustee may hold the office for a period of three years. As stated by the rules, each member contributes a sum equal to 10% of the basic salary each month that is deducted by the bank at the time of payment. BRAC Bank Limited matches the employee‟s contribution with a monthly payment equal to 10% of the basic salary of each member. Every half year, each member‟s account is credited with interest pertinent to the income earned on the investments from the fund. The sum of money given by the members and the amount contributed by the bank are credited separately to his/her account in a special ledger kept by the trustee at the head office of the bank in Dhaka. At the time of resignation or retirement, the employee is entitled to receive the employer‟s contribution and the accumulated interest subject to his or her length of membership in the contributory provident fund. If the employee has been a member for less than or equal to year then he/she will not be eligible to receive any of the above mentioned contributions. He/she will only be able to obtain his added contributions over the period of his membership. If the duration of membership has been equal to or less than three years then the member will be entitled to receive 50% of the employer‟s contribution and accumulated interest. If the duration of membership has been more than 3 years then the member will be entitled to receive 100% of the accumulated interest and employer‟s contribution. In case a member is dismissed due to negligence or incompetence, he or she will be entitled to receive her/her own contribution along with the accrued interest thereon at the settled interest rate. The bank‟s contribution however may be forfeited and distributed among the members according to the individual balances of the members. The same is applicable in case of an employee dismissed from the bank due to misconduct or fraud. However, for such purposes, only the trustees shall be the sole judge of whether the cause of dismissal or forced retirement is significant enough or not. Employees of the grade JO to SPO may be the members of this fund. The amount to be received by the employees under such special circumstances would be settled on by the fund management committee after thorough assessment of the claim application and relevant documents. Staff loan is granted to regular confirmed employees of the bank. The duration of service of the employee has to be at least a year long. The employee can apply for loan extending up to 5 times of his/her gross salary at 10 % interest rate. Employees who have had a service length of 5 years and above are eligible to apply for house building loan. A committee will oversee the loan application and monitor the location for house building the debt burden ration of the employee and other relevant issues. The debt burden ratio for the employee has to be 50% or below for the loan to be approved. The repayment schedule for the loan has to be before the retirement of the employee. The interest rate of the loan is 3%. In case a confirmed employee is asked to resign from his/her services by the relevant authority without stating any reason, he/she is eligible to receive one month‟s notice in writing or one month‟s gross salary as payment. If the employee is duly notified with one month‟s notice, he/she will not be entitled to receive any form of compensation for the termination of services. In the event that a report/information about misconduct or fraud is received against an employee, he/she has to undergo stages of disciplinary proceedings. The employee is presented with charge sheet and is given 4 days to come up with an explanation. A preliminary enquiry committee is formed and an enquiry notice is issued that marks the beginning of a proper domestic enquiry. If, according to the committee‟s report, the employee is found guilty he is duly punished. In case the employee is found not guilty, he/she is retained with due respect. During the period of enquiry, the employee may be suspended and will only receive 50% of his basic salary. In case he/she is proven to be not guilty, then the full amount of salary must be refunded to the employee. We know that the word „Administration‟ means controlling people. In BRAC Bank limited, HR Operations is much more than just controlling. It includes motivating the workforce, encouraging them to be more productive and innovative, leading or selecting or providing an appropriate leader for a leaderless team. Some smaller and simpler day-to-day functions are carried out by the Administration as well. These includes employees‟ leave balance monitoring and approving if they can avail leave, if „yes‟ then planning and suggesting how many days, which days etc. Checking and approving employees‟ different loan (House Building, Personal, Car etc.) requests. Administration also carries out quarterly „Reward and Recognition‟ event which is called „The Town Hall Meeting‟. Here BRAC Bank employees get rewarded based on their quarterly performance evaluation. Operations also has to undertake some harsh duties which are Show Cause letter issue, Warning letter issue, issuing letter of Termination, issuing Dismissal order, Audit and Investigation etc. These are certain unavoidable and rare incidents caused mostly by employees and their personal issues that directly violate Bank‟s code of conduct. The HR Vista DBMS Software specially designed for BRAC Bank is used by the Administration for employee record updating. Operation also carries out Confirmation, Renewal of Contract and Promotion formalities. Since BRAC Bank focuses more on SME sector, the Bank heavily depends on their Customer Relations Officers (CRO). Due to their educational level and type of duty depends on ethical standards, the CROs are often required to be monitored and lead. Assigning a good Sales Team Leader (STL) for different CRO teams in different districts is also a task of HR Operations. Another motivational factor rewarded and monitored by HR Operations is „Bright Ideas‟. Bright ideas are usually those which employees come up with from their own judgment and if it benefits the Bank (e.g. Cost reduction, organization or work process development) then it is considered is considered as a Bright Idea . the respective employees are rewarded accordingly as a factor of motivation. All officers will become eligible for annual leave of 24 working days after completion of one-calendar year. Of these 24 days 15 days must be taken as consecutive leave each year. Any pending leave may be carried forward to the next year. Annual leave encashment facilities may be allowed to the person for a maximum of 90 days at the time of Employee‟s leaving the bank. Any leave taken in advance to be adjusted during the final settlement period. Casual leave up to 14 calendar days can be granted per year to an employee who may be unable to attend duty due to sudden illness or urgent private affairs. Not more than 2 days casual leave can be taken at a time in a month. Casual Leave more than 3 days will be considered as sick leave and has to be supported by medical reports. In case of prolonged illness the Managing Director may grant medical leave in excess of sick/casual leave with full pay and allowances for a period up to one month. Maternity Leave: Female (confirmed) employees will enjoy 4 months maternity leave. One employee will be entitled to avail this leave for 2 times in her entire service period. Study Leave: Study leave of maximum 2 years can only be granted to an employee without pay and allowances provided he/she has put in at least three years of service. This Leave is only granted to those employees who have achieved a minimum of 3 years of service record with the bank and also to those who are due to retire within 5 years of the date on which he/she is likely to return from the study leave. This leave shall, however be allowed in the entire period of service. Leave without Pay: Leave without pay may be granted to an employee in special circumstances where no other leave is admissible under these rules. In case of Leave without Pay, the period does not exceed 60 days. Leave during Probation Period: For sick leave in the probation period, the leave has to be specially mentioned by the department. Casual leave will be granted to probationary employees after completion of 6 months. Any leave taken prior to completion of 6 months will be adjusted against the casual leave. Encashment Facilities of Annual Leave: Annual leave encashment facilities may be allowed to the employees for a maximum of 90 days (based on last basic) at the time of employee‟s leaving the bank. A person selected for appointment with less than 3 years job experience will be on probation period of one year. An employee with job experience of 3 years or more will be on probation for 6 months. dispense with his service by giving one month‟s notice or by paying a sum equal to one month‟s pay without assigning any reason. An officer shall become eligible for confirmation in the specified post subject to employee‟s successful completion of the period of probation. In the case of one year, if the person fails to show satisfactory progress, employee‟s appointment will be terminated. The confirmation of service of all officers and employees in the services of the Bank shall take effect on and from the date as will be specified in the order of confirmation. Managing Director of BRAC Bank Limited and after that it will be approved signed by the Managing Director. According to the comment and remark of appraisal form the employee will get the confirmation with increment of salary or confirmation with promotion or no confirmation. Regular promotion is given according to the employee‟s regular performance. When the supervisor or department head of the employee evaluate that his employee is become an asset for the bank and deserve promotion then the supervisor or the department head take a promotion appraisal form from HRD and recommended the employee for promotion. In the procedure the HRD head send this appraisal form with his approval signature to the Deputy Managing Director of BRAC Bank Limited to approve and forward it Managing Director of BRAC Bank Limited and after that it will be approved signed by the Managing Director. According to the comment and remark of appraisal form the employee will get the promotion with increment of salary. Performance Matter (PM) is the annual performance report of individual employee of BRAC Bank Limited. According to Performance Matter ranking scale the employee can get promotion in the job grade of their own. According to the policy any employee can‟t get any promotion within a year after the employee‟s joining in the BRAC Bank Limited. And on the other section the employee can get promotion after six months of his previous promotion. A confirmed employee may leave or discontinue from the services of the bank by giving one month notice, in writing or pay to the bank as compensation an amount equal to the employee‟s total pay for one month. Probationary or any temporary employee shall leave or discontinue employee‟s service from the Bank by giving 15 (fifteen) days prior notice in writing of employee‟s intention to do so or pay to the bank as compensation an amount equal to employee‟s total pay for fifteen (15) days. Note: Certificate will not be provided to staffs who were forced to resign, got “unsatisfactory” rating in their Performance Matters or have integrity issue and nonconfirmed staff. The service of a probationer or a temporary employee shall be liable to be terminated by the competent authority without assigning any reason without giving him or her any notice and the probationer or the employee shall not be entitled to any form of compensation for termination of service. BRAC Bank Limited has perfect policies to maintain and control their employees. As it has a large number of employees which is very difficult for any organization to control but BRAC Bank is controlling this huge number of workforce with great distinction. The „X‟ & „Y‟ motivational theories are rightly used by the Human Resource Division to control the employees properly. Well organized team. While they work as a team they are supportive to each other‟s which are very helpful to fulfill their work. Well maintained CV database. All the CVs are stored in monthly basis so it is easy to find out the CVs when it is needed. Better employee motivation generation through internal recruitment opportunity. So employees try to put their utmost effort to get a higher position. Less dependent on external recruitment agencies. In one word it can be said that they are self-dependent while any recruitment is needed and doing this by their own they are also saving time. Training opportunity provided to employees working in every level. For better performance of every employee training is provided. Effectively Stringed with other departments of BRAC Bank. The communication among each and every department is quite good and all of them have better understanding. As a result they get effective output. The Employees of BRAC Bank Limited respect Human Resource Division and the Human Resource Division earned it. The overall situation of Human Resource for a company like BRAC Bank Limited is not that much controlled to be used and utilized it perfectly. Compare to the workload there is not sufficient amount of refreshments. Too much work pressure on the employees sometimes makes them depressed towards their work. References from superior levels are also entertained as those CVs are always given priority in times of recruitment even if the candidate is unfit or unqualified for the vacant post. The salary structure is not high enough according to the workload of the employee. This discourages the employees to work hard and also increases turnover rate. Due to lack of sufficient amount of manpower it is difficult to control and maintain the large amount of employees. Online recruitment system is not upgraded. Foreign training should be included. Promotion policy should be upgraded. BRAC Bank Limited has approx. 8000 employees to work with. This huge number of workforces helps this bank to get various ideas and plans and increase its productivity. The Human Resource Division is always thinking to do something new with their employees that can help to motivate the employees and can able to make them better resources/assets for the BRAC Bank Limited. Very few Bangladeshi organizations have this kind of opportunity to be used. BRAC Bank Limited has a huge number of employees. So is difficult to maintain the Human Resource policies with this large number of employees. The resignation rate is too high in BRAC Bank Limited then it anticipated. Reference control on policy is common situation of Bangladeshi organization. BRAC Bank is not out of it. Reference control on Human Resource policy can be a bad threat for BRAC Bank Limited. More Recognition should provide so that employee did not resigned from their post. In this part of recommendation, some valuable issues of BRAC Bank Ltd. (BBL) are discussed. These were the aspects that came out while working as an intern at BBL. These were related to various parts of BBL and thus are placed in the list of general recommendation. According to SWOT analysis some decision can be taken. Efficiently distribute the number of employee in required position. Make the salary structure attractive to the employee. Reduce the extra workload of the employee. They should increase the manpower of HRD. The Human Resource Division‟s control must be structured. Arrange co-curricular activities for employee‟s refreshment. Managerial control should be implemented perfectly. Arrange proper training for the employee. The training should be motivational. Online recruitment system is not upgraded. They should upgrade it. Better MIS support is needed for smoother operation. Extra benefits should be provided. Foreign Training should be provided. Promotion policy should be changed. Salary review in the content of other banks in Bangladesh. Finacle software should be upgraded. BBL does conduct the employment satisfaction surveys through their centralized information system. But according to my observation employees hesitate to give their honest response as they fear their PIN can be detected in the IS and their opinion might be transparent. Thus, BBL can introduce anonymous survey procedures such as “Survey Monkey”. In this way the survey will be helpful for the organization itself. BRAC Bank intends to set standards as the market leader in Bangladesh. It demonstrates that a locally owned institution can provide efficient, friendly and modern banking service on a profitable basis. Human Resource Department is the most confidential department for any organization as well as Human Resources Division in BRAC Bank Limited. Here as an intern, limited information was collected for preparing this report because of too much confidentiality. It was an honor to work as an intern in a reputed organization like BRAC Bank Limited. The BRAC Bank Limited is a bank that confirms the best service to the customers as well as to the employees by Human Resource Division. 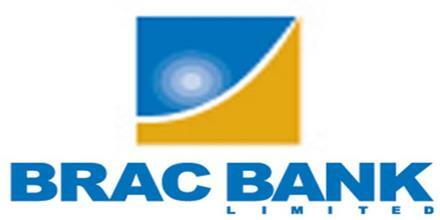 BRAC bank Limited is the fastest growing Bank in Bangladesh. By working in HR Division the knowledge was learnt would be helpful enough to sustain with the real organizational environment.